"You Are Happy" In The Morning! 11:00 at the Southern Vermont Dance Festival in Brattleboro, VT. I recently was able to see Eliza's solo for the first time when she and Rachel were camping out in my living room for their successful run of Capitol Fringe shows. The 30 minute solo is mesmerizing, and Eliza weaves stories, Shakespeare, images shot on the shoreline and movement that ranges from intense to flowing. You won't want to miss it, it is definitely full of images that you will ponder well into the afternoon. Mountain Empire Performing This Week In D.C. 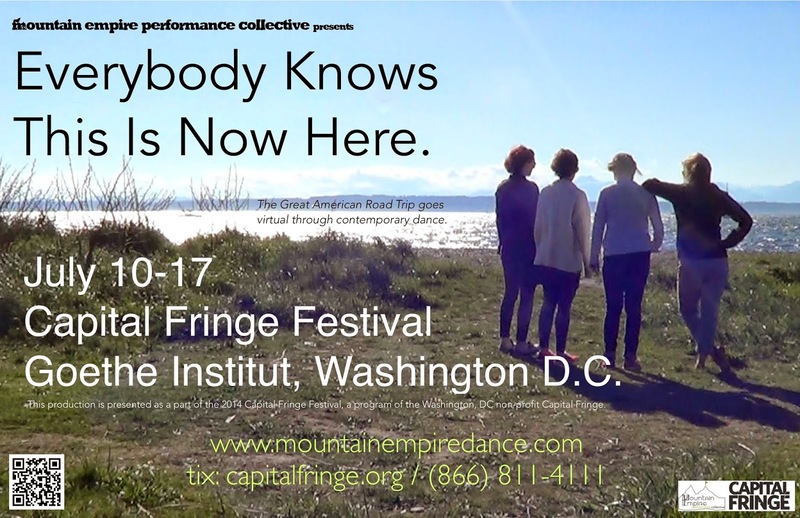 The Capital Fringe opens this week and Mountain Empire has convened in the capitol to premier the evening length work Everybody Knows This Is Now Here. There are multiple shows, so gather your friends, get your fringe tickets and see what unfolds each night in this constantly shifting performance. Each night will be slightly different, just like every cross country sojourn back home or to your favorite haunt. Labels: Capital Fringe, CapitalFringe, Dance, Eliza Larson, Goethe Institut, Improvisation, Modern Dance, Mountain Empire, Mountain Empire Performance Collective, Rachel Rugh, Washington D.C.